That should be about 27 km from the blast. 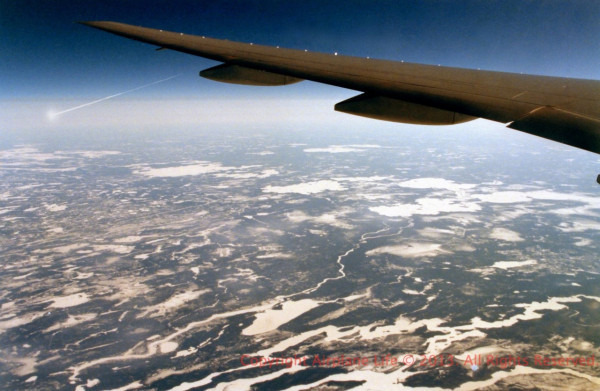 Alleged photo of the meteor from an airplane. I can't help but be a little bit skeptical. Also, here's a great video showing 2012 DA14, a meteor, and many satellites. I'm pretty certain it is fake. The meteor broke up well above the height that airplanes fly, yet in the photo it appears to be below the altitude of the plane. This could be explained if the meteor is very far away and partially below the curvature of the Earth, but then the meteor should be significantly reddened by Rayleigh scattering (see for example the videos from ground taken from far away where the meteor is near the horizon), yet here it is quite white. Additionally, the event took place shortly before dawn, whereas the photo appears to have been taken during broad daylight. A longer exposure could explain the lighting, but this contradicts the very short exposure for the meteor. The meteor broke up well above the height that airplanes fly, yet in the photo it appears to be below the altitude of the plane. No it doesn't, it looks like it is extremely far away, beyond the visible horizon, so the altitude would be correct when you account for the curvature of the Earth. Maybe, but it looks like it could be overexposed enough to explain that. Additionally, the event took place shortly before dawn, whereas the photo appears to have been taken during broad daylight. Ultimately though, I agree, it does look fake. It has been an eventful year for space enthusiasts, with it seeming like a new asteroid is announced every week, each one coming closer and closer to our blue marble. Then, just a few days ago, a large asteroid smashed into Russia, injuring over 1000 people. Now a researcher and a physicist have teamed up to propose a solution to the problem – a laser-beam generating solar-based asteroid destroyer that could destroy a space rock half the size of a football field in 30 minutes. Philip M. Lubina, a physicist and professor from the University of California Santa Barbara, and Gary B. Hughes, a researcher and professor from California Polytechnic State University are responsible for the concept, which you can see in the image above. The project is called DE-STAR, which stands for Directed Energy Solar Targeting of Asteroids an exploRation. The system will work by using solar panels to turn energy from the sun into a “phased array” of individual laser beams that are channeled into a single mega-laser beam that eradicates the asteroids, a la the Death Star. If the asteroid is too large, DE-STAR would work by deflecting it away from our fragile planet. The best part? The concept is based on technology that is widely available now. Said Hughes, one of the two who developed the concept: “This system is not some far-out idea from Star Trek. All the components of this system pretty much exist today. Maybe not quite at the scale that we’d need –– scaling up would be the challenge –– but the basic elements are all there and ready to go. We just need to put them into a larger system to be effective, and once the system is there, it can do so many things. The DE-STAR should be about the size of the ISS to change asteroid orbits. A 10 km long DE-STAR could destroy asteroids and comets up to diameters of 10km. 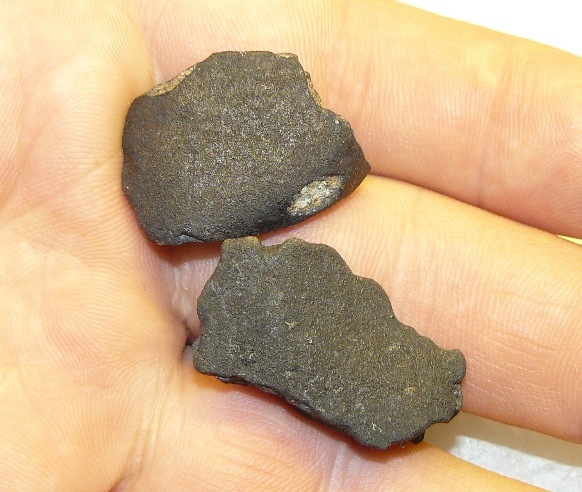 It would take thousands of years for any larger asteroids. A DE-STAR that is 1000km long should be able to use lasertechnology to swing a spacecraft out of the solar system at near speed of light. Many such fragments have been found. Did they ever find what made the huge hole in the ice? No. They will certainly look again when the ice is gone. And I'm sure meteorite hunters will continue the search once the snow clears. Most of the fragments found so far were found looking for holes in the snow, but fresh snow eventually covered that. The best time to look will be right after the snow clears before undergrowth covers the ground. The fireball path has splits because the camera was set to shoot 1.6s exposures. http://www.reddit.com/r...._lights Did you post this, Midtskogen? If not, somebody is stealing your work. Did you post this, Midtskogen? If not, somebody is stealing your work. I don't think that midtskogen is the author of that image, he was just sharing it. Indeed, and he did seem to be claiming the work as his own, so there is a clear case of wrongdoing. My comment bringing it up is getting some upvotes, so hopefully people realize it's stolen.